Bharatiya Janata Party (BJP), as per its anti minority and anti reservation stance welcomed the Supreme Court's refusal to stay Andhra Pradesh High Court's decision quashing the minority sub-quota. Its spokesperson also charged the Congress-led government with having a communal agenda and going in for "vote-bank politics". The implications of this understanding mean that the prevalent disparities should continue. BJP’s goal is not a society based on equity and justice as it is guided by ‘religion based nationalism’. 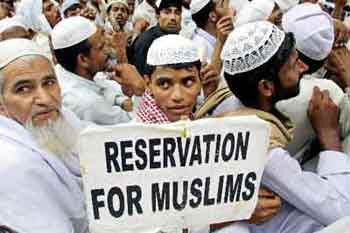 Some others pointed out that the ruling party Congress, as such does not want the quota for Muslims in the real sense. This perception comes because Congress party does show a lack of will power in the direction of affirmative action for weaker sections of society as a whole and about Minorities in particular. As such Constitution does allow quota to educationally and economically backward classes. Today Muslims are educationally and economically very backward community in India. Its educational backwardness has been repeatedly pointed out by HRD ministry and Home Ministry in their reports for a long time. And the economic condition has been highlighted by Sachar Committee (2006) and Rangnath Misra Commission(2007). In this light how can the sound legal case be made to actualize the social and political need of our society to get economic justice to minorities, is a challenge for the Government.